Caroline Spector is the latest blogger on the Wild Cards website, with a tribute to Hoodoo Mama wherein she blames me for... well, everything. It has zombies. Everyone loves zombies. (FWIW, Hoodoo Mama is my own pick for "My Favorite Wild Cards Character That I Created But Have Never Gotten to Write Myself"). Hello there! I'm assuming you can't comment, but is there any timeline or eta as to when we can expect to see a Wild Cards pilot?! One other thing... are there plans to release audiobooks for the entire Wild Cards series? I love listening to the books, the people who read for all the characters are great! That's surprising. You never followed X-MEN? He's been around since the early '90s. And I never followed ANT-MAN when I still followed comics, which I stopped doing in 1993 or so, but ANT-MAN was a good movie. It should not be disrespected. I think it depends on which Ant-Man we are talking about. Gambit for sure has always been a central figure in the X-Men comic universe, but not in the cinematic universe. That's great (Who wouldn't love zombies?)! I have actually sent you an email yesterday about all your works with great news that I hope you will like (I do hope so). Thanks for always keeping us posted about these developments! It's good to hear you're okay. First of all, I'm a very big fan of your work. I read A Song of Ice and Fire books too much I couldn't count, and I patiently wait your next book. I would like to ask you two things, about the hungarian history. What do you know about it and did you get any inspiration from our history for your books? 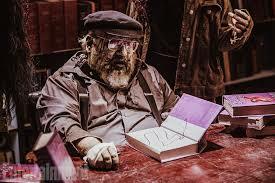 I hope you enjoy your days, and I can't wait your next ASOIAF book to publish. Hey I know this is completely unrelated comment on this post, but I love your work on ASOIAF. I first came to know about the series when I googled the show. Instead of watching the show, I started by reading your series being a book addict. I have watched the show just because of the novels and I love it. The show is great but it can't compete with the Novels. I just hope you can take some time out and visit India. You might not know, but you have a very big fan base here. By the way, have you ever VISITED INDIA? P.S. : not going to ask about TWOW😂, not because I am not eager for it, but I know that quality needs time. Whenever you release, just make sure it's worth our wait. And I hope you might visit India anytime soon!! When it comes to creating wildcards characters, do you have equal input with the writer for a particular character, or are the writers pretty free to do whatever they want? The writers create their own characters, but of course as editor I have the final veto power. I reject as many characters as I accept.